If you are anything like me, and get migraines all the time, you’re probably willing to try just about anything to help remedy them without always resorting to pain killers. I’m no expert but here are 10 different ways that I have found helpful for my own headaches/migraines. 1. HYDRATE. HYDRATE. HYDRATE. I can’t say this one enough. It’s very common for migraines to come as a result of dehydration. Most of the time we don’t even realize we are dehydrated. I heard once that once you feel the sensation of thirst, you’re already dehydrated. I try to drink a lot of water when I feel a migraine coming on and sometimes it’s as simple as that. Stay hydrated! 2. Apply Heat or Cold. I always keep a cold water bottle in the fridge or freezer for when my head seems to be pulsing. I’m not sure if it’s the numbing effect or what but the cold makes it feel so much better! The heat can also help by relaxing all that tension that’s going on up there. 3. Relax! Listen, we know we all are busy and have important things to do but physical activity is only going to make it worse. The sooner you recover, the sooner you can get back to that to-do list. Sit back in your chair, lie in your bed, and even take a short nap if possible! Close your eyes and/or turn off any harsh lights that might be contributing to your migraine. Stress is your head’s worst enemy! If you’re feeling high anxiety/stress and you sense a migraine coming your way, take some deep breaths and relax for a bit. Your health is important! 4. Eliminate Strong Smells & Get Some Air. This is a big trigger for me. If I’m sitting by someone with some strong smelling cologne or perfume, it’s only a matter of minutes before I feel someone terribly painful trying to make its entrance in my head. Often times, candle warmers and room fresheners trigger it as well. If this is the same for you, get rid of them or experiment with other smells that might not be as strong. If it’s the cologne or perfume of someone close to you, just tell them! No one wants to be causing you pain (hopefully). If it’s at a gathering and you feel a migraine coming on, step outside and take some deep breaths of fresh air. 5. Cell phones, TV, & Computers. Some of my worst migraine days come as a result of staring too much at an LED screen. Constant scrolling, flashing pictures, and bright screens can be really harsh on your eyes and head. Take a break every once in a while. Even if it’s only a 5-10 minute break, give your eyes something else to look at besides a bright screen. I sometimes even close my eyes or look away when I’m scrolling on the computer or my phone to cause less strain. 6. Peppermint oil. If you don’t already have this, it might be worth the investment. Peppermint oil has so many uses! Peppermint oil is anti-inflammatory and will help calm your nerves. Just put a couple of drops on your head, leave it on for 15-30 minutes and let it work its magic. I LOVE peppermint oil and have used it several times when experiencing a headache or migraine. However! If you’re going to use peppermint oil, it might be best if you’re planning on lying down for a while. The oil is so strong, I always have to close my eyes for awhile so I don’t feel like it’s in my eyes. But that’s just me. 7. Healthy Sleeping Habits. I cherish every moment I can to soak up as much sleep as possible. High school seems like one big dream for me since I slept through most of it. When I first started getting migraines, I’d try to sleep it off through long naps. BAD IDEA. Sometimes I’d go to bed early and then sleep in only to wake up to yet another migraine. Don’t do it. I have three pieces of advice when it comes to sleeping and migraines. 1. Don’t shortcut your sleep. 2. Don’t overdo your sleep. And 3. Take short power naps if you need. I know, seems impossible, but try to find balance and routine when it comes to your sleeping habits. 8. Magnesium. There was a study I read once upon a time that people who constantly deal with Migraines are sometimes low in Magnesium. I started taking Magnesium a couple of months ago and didn’t even realize I was experiencing less migraines (you notice more often when it’s there than when it’s not, Ha Ha!). Maybe try taking Magnesium and see if that reduces the amount of times you experience migraines. 9. Pressure on Temples. This one is kind of a “no brainier” since we instinctively put our hands to our head when experiencing pain there anyways. 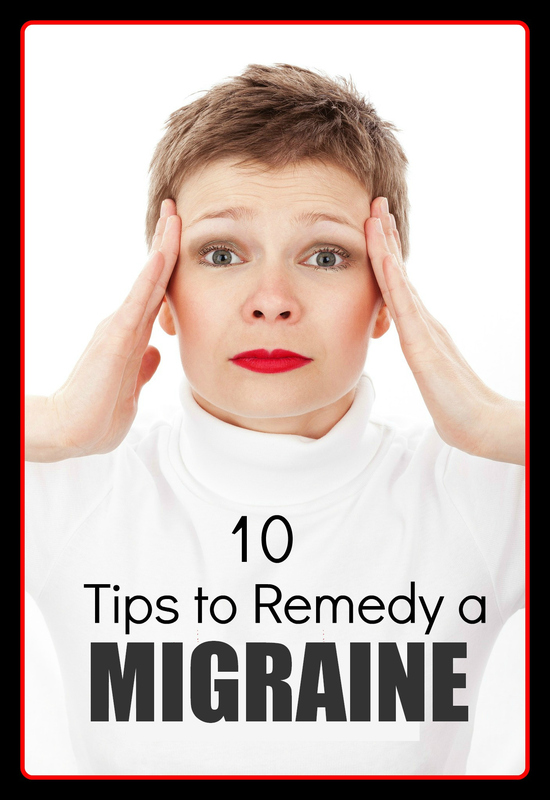 It obviously doesn’t offer lasting relief, but if you’re trying to endure through something with a migraine and need temporary relief, put some pressure on, or rub, your temples. 10. Figure out Triggers. Everyone can have different triggers. For me, a migraine usually results from not even water, strong smells, or poor diet. Pay attention to what your body is trying to tell you. What triggers your headaches and migraines? If you need to, keep a written log of when you’re experiencing them and what happened that day that might have triggered it (diet, smells, low water intake, tv, etc…) until you get it figured out. Hopefully one of these remedies will help you with your own headaches/migraines like they have mine. What other remedies have you used to help soothe your migraines?